I am setting up a workspace for a temporary project. I already set VS and SQL-Server (both are running fine) but now I am struggling with IIS. Actually this is not the first time... every time I have to use IIS is a nightmare. Unfortunately the project is based on a complex site package that demands it and so I have no other alternative. 1) Entered Control Panel and added IIS. To be absolutely sure about this I checked EVERY checkbox including even what I probably wouldn't need. 2) Rebooted, entered Opera, and tried localhost. Nothing. 3) Then I CMD and iisreset as administrator. It stopped and restarted service successfully, so apparently the service should be there. However, in TM services tab I just see IISADMIN running. Is this correct? 4) This time I didn't reboot. I just entered Opera, and tried localhost. Nothing. Can you access IIS manager? In the pass-through authentication (button 'Test settings...') it authenticated but failed authorization. Don't know what it means. On binding I wasn't sure of what to choose then I picked 'net.tcp'. However the OK button is still grayed out. I realized that to ungray it I have to type something in the 'Binding Information' field although I have no idea what. I just followed the instructions but there is not a 'DefaultAppPool' option. 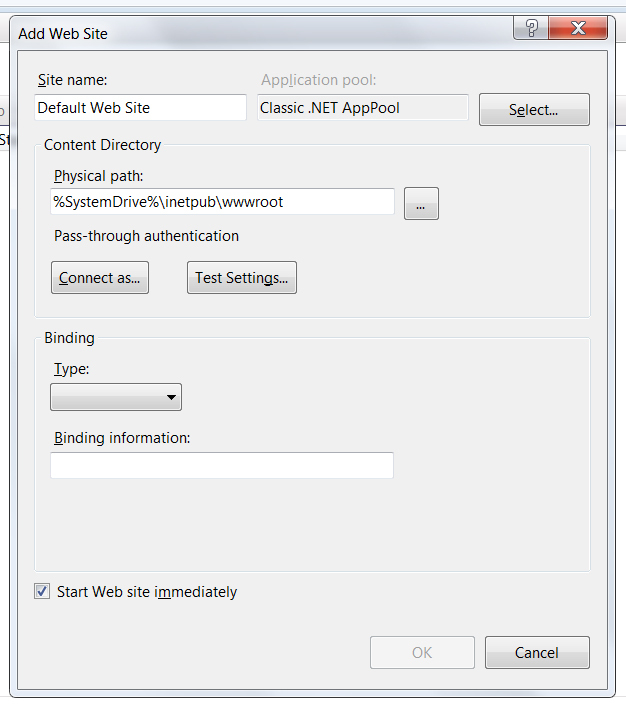 The closest as possible is 'Classic .NET AppPool' so I picked it. In the instructions it says 'leave Binding and everything else as is'. I did. The OK button is still grayed out. I think something hasn't installed correctly, the type box should have http or https options only. Maybe remove IIS and set it back up again. Hey, z3r010! While you typed I was just trying it and it is fixed now! The instructions found here has healed the problem. I just disabled IIS and WAS, rebooted, enabled IIS and WAS and rebooted. The default site is back and localhost is working on browser now. Chrome does not work, no web page opens. Opens as a blank page.